Here's another chance to play geographical detective! This natural-color image from the Multi-angle Imaging SpectroRadiometer (MISR) represents an area of about 375 kilometers x 407 kilometers, and was captured by the instrument's vertical-viewing (nadir) camera in May, 2002. 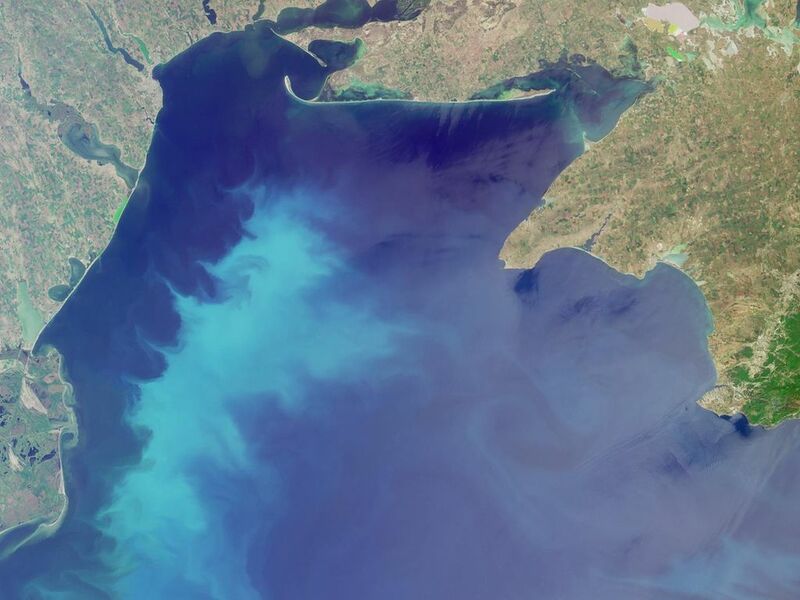 This mystery concerns a large body of water (the blue waters which dominate most of the image) and the region surrounding it. Use any reference materials you like and answer the following 5 questions. 1. Three of these statements about the large water body are false. Which one is true? (A) The deepest portion of the water body is less than 2000 meters deep. (B) The shallow waters of the northwest section of the water body are less saline than in deeper waters. (C) A rich biological community of worms and crustaceans thrive in the mud below 180 meters depth. 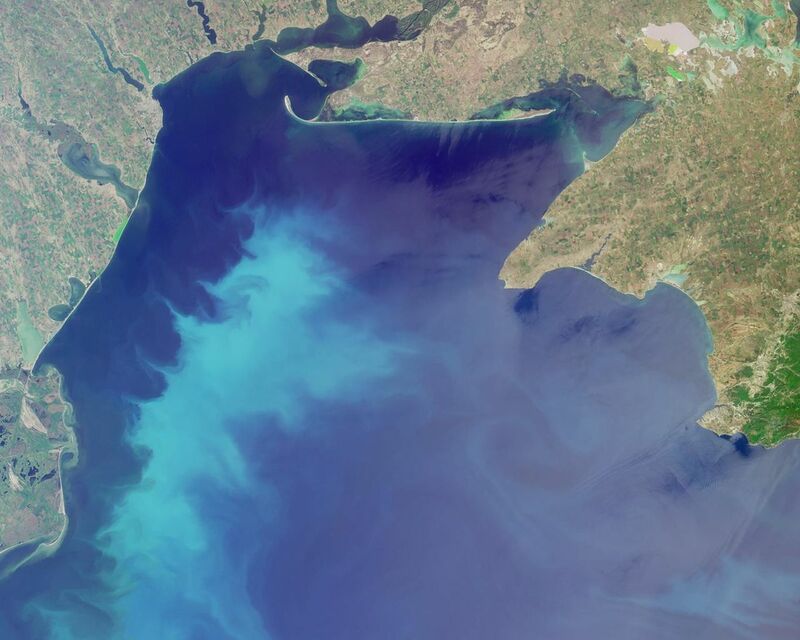 (D) Algae and plankton form a vast and productive underwater "meadow" in the relatively shallow northern waters. 2. Three of these statements about the large water body are true. Which one is false? 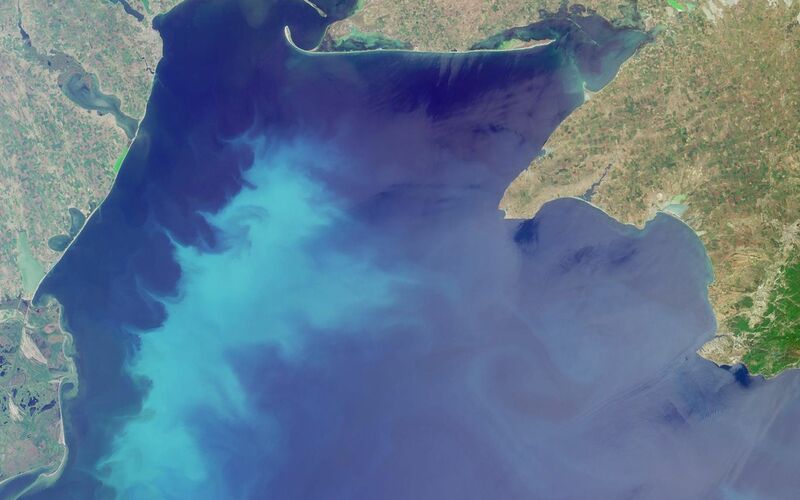 (A) The pale blue swirls of color in these waters indicate calcareous phytoplankton called coccolithophores. (B) Since the 1960s, coccolithophores have become more abundant, and diatoms (another type of phytoplankton) have decreased. (C) Early seafarers used the prevailing clockwise circulation of the currents to navigate these waters. (D) Archaeological relics discovered under 100 meters of water indicate that the coastline was lower several thousand years ago than today. 3. Three of these statements about human activities within the area are true. Which one is false? (A) There have been more than 10 geological studies conducted to determine the petroleum potential of the region. (B) More than 20 fish species once found in the large water body have become "commercially extinct" over the last 50 years. (C) One country within the image area is reported to have a 99.7% literacy rate or better. (D) Many of the navigable rivers are forced to close for up to one month during winter. 4. Three of these statements about the river whose delta, or mouth, appears along the lower left-hand edge are false. Which one is true? (A) The freshwater inflow from this river to the large water body is approximately twice the amount of saltwater inflow to the large water body. 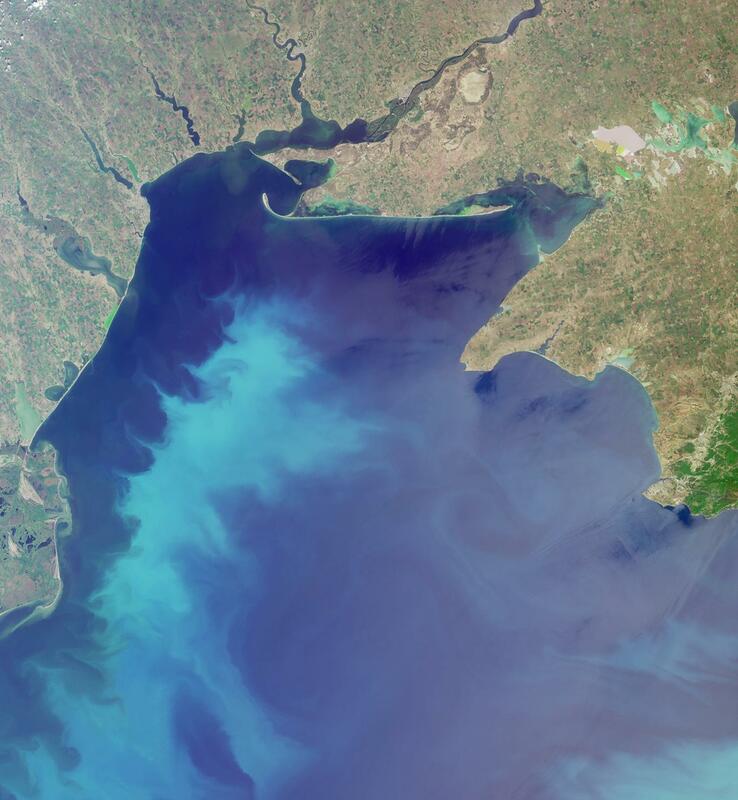 (B) The entire river delta falls under the jurisdiction of one country. (C) Contaminated water from a mining disaster that occurred hundreds of kilometers upstream (in January 2000), took less than 30 days to reach the river mouth. (D) Over the past 20 years, the discharge of nitrates and phosphates from this river have decreased compared with 1960s levels. (D) both of these places. 6. A sinuous river curves toward the large water body in the upper-central portion of the image. Near the mouth of this river, a small orange spot can be discerned along the right-hand bank, near a small city known by two names. Name the most likely cause for the orange color at that location. E-mail your answers, name (initials are acceptable if you prefer), and your hometown by the quiz deadline of Tuesday, August 17, 2004, to suggestions@mail-misr.jpl.nasa.gov. Answers will be published on the MISR Quiz page . The names and home towns of respondents who answer all questions correctly by the deadline will also be published in the order responses were received. The first 3 people on this list who are not affiliated with NASA, JPL, or MISR and who have not previously won a prize will be sent a print of the image. A new "Where on Earth...?" mystery appears as the MISR "latest featured image" approximately once every two months. New featured images are released on Wednesdays at noon Pacific time on the MISR home page, http://www-misr.jpl.nasa.gov. The image also appears on the Earth Observatory, http://earthobservatory.nasa.gov/, and on the Atmospheric Sciences Data Center home pages, http://eosweb.larc.nasa.gov/, though usually with a several-hour delay.